The professors will connect Gustavus research students with the fundamental chemistry behind real-world disease and agriculture issues. Gustavus Adolphus College chemistry professors Scott Bur and Amanda Nienow were recently named winners of grants from the National Science Foundation (NSF) to support their continued research. Both professors are being recognized with an NSF grant for the second time, and both plan to include Gustavus undergraduates in their ongoing research projects. Bur, who has taught at Gustavus since 2003, was awarded a $236,068 grant to explore genetic mechanisms in parasites that can cause diseases. By the end of the three-year grant project, Bur hopes to have identified a chemical probe that can disrupt critical interactions in the cells, helping researchers understand what happens when specific parts of gene regulation are blocked. 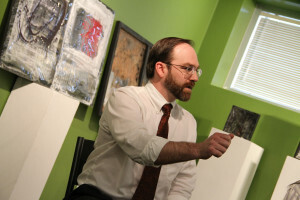 To do this, his team will focus on gene-regulating proteins that contain a region known as the bromodomain, which allows them to test the effects of tiny modifications to DNA that tell the cell where a gene is located and how to access the gene. The particular organism Bur’s team is focusing on is Plasmodium falciparum, a parasite that causes malaria. The project explores the fundamental science of gene storage and expression, building a base of understanding that may eventually lead to the development of drug therapies that are targeted enough to kill the malaria-causing organism without harming the human. “Ultimately, we want to get to a point where we understand the DNA well enough that if something goes wrong at the cellular level, we can find a way to ‘shut off’ that gene transcription instead of trying to treat the issue after it causes problems,” Bur explained. Students in Bur’s lab learn how to transform bacterial cells with recombinant DNA to produce specific proteins, design and synthesize drug-like molecules, and develop ways of testing these molecules against the protein. Other students might use x-ray crystallography to understand how molecules interact with proteins, study small fragments of proteins that are involved in DNA storage, or analyze different variants of the protein, such as the human version, to see how molecules can selectively inhibit the parasite’s protein but not the human’s. Bur highlighted the work of the Gustavus Office of Research and Sponsored Programs, which works with faculty members to identify grant possibilities, prepare proposals, and secure funding that supports increased research opportunities for professors and students alike. Nienow, a member of the Gustavus faculty since 2007, won a $217,674 grant to continue her research on the environmental and agricultural impact of the herbicide dicamba. On the market for over 30 years, dicamba has been used more heavily since 2017 because of the introduction of genetically modified soybeans that can tolerate the herbicide. Her research centers on how dicambra undergoes changes through reactions with other compounds, sunlight, and water. 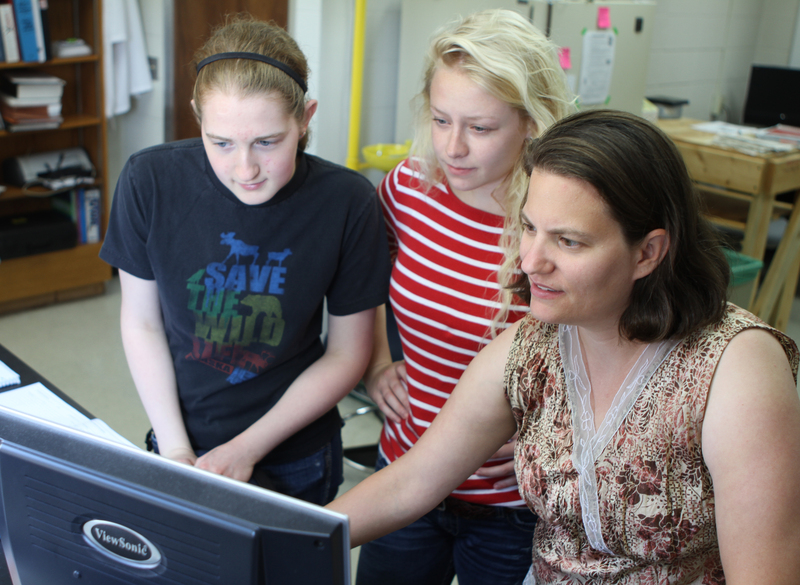 Amanda Nienow with a team of research students. Like Bur, Nienow’s research focuses on questions of fundamental chemistry, which has implications down the line for agricultural usage, herbicide development, and product safety. The grant will allow her to build a dedicated and sustainable team of research students that work full-time throughout the summer and continue their research throughout the academic year. 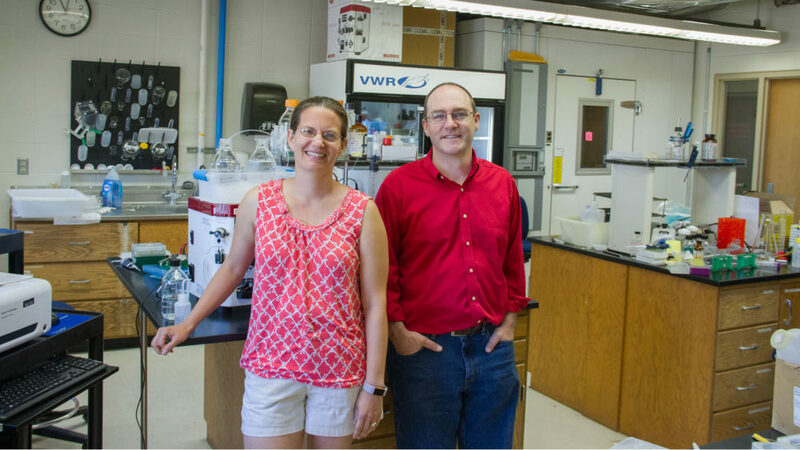 Nienow expects her students to attend national conferences and to travel to France to experience international chemistry work in one of her collaborator’s labs. Capitalizing on the College’s location in agriculture-rich southern Minnesota, the professor also plans to work with a Gustavus student to develop “Chemistry Night” events for high school students, which would expand the department’s youth outreach by introducing instrumentation and chemistry-based problem solving to teenagers who are interested in scientific research. The National Science Foundation (NSF) is an independent federal agency created by Congress in 1950 “to promote the progress of science; to advance the national health, prosperity, and welfare; to secure the national defense…” NSF supports basic research and people to create knowledge that transforms the future. This type of support is a primary driver of the U.S. economy, enhances the nation’s security, and advances knowledge to sustain global leadership.